We talk a lot about utilizing your nonprofit CRM/donor management software to its full potential and making sure you’re taking advantage of all the features available to you, but we also understand that many of our readers may not have transitioned to using donor management software to track donor data yet. If you’re still using spreadsheets to keep track of funds, donors and other data (*cringe*), we highly encourage you to consider these five reasons why your nonprofit needs a donor management system. Security and organization: Keeping all of your donor information in Excel spreadsheets may not be your most secure option. Donor management software is often available on the cloud or can be hosted in your own environment, meaning that you have more security options in case of internal or external fraud, hacking or natural disasters. Keeping donor data in a secure system, especially in the cloud, means you can access it from anywhere and perform database backups. In addition, you don’t have to worry about misplacing donor data. The CRM features allow you to be organized and thorough with your donor information. Availability of reports and analytics: There are some trends that you may be able to pull from a spreadsheet, but a donor management system like ResultsPlus comes standard with hundreds of reports and allows you to customize your own to pull the data that YOU need. Whether you need to get extremely specific or very broad, it’s important to your fundraising efforts to be able to analyze the data you’re putting in. Ability to track trends: Once you’ve pulled reports and analyzed the data, a fundraising CRM gives you the ability to track trends amongst your donors or with specific campaigns. Wondering where you’re at with your fundraising goals? How many lapsed donors you have? Which campaigns a major donor has contributed to? These are important statistics to have as you work to continually improve your nonprofit’s fundraising. Grow as you go: Whether you have 5,000 records or 5 million, a donor management system can grow with you. 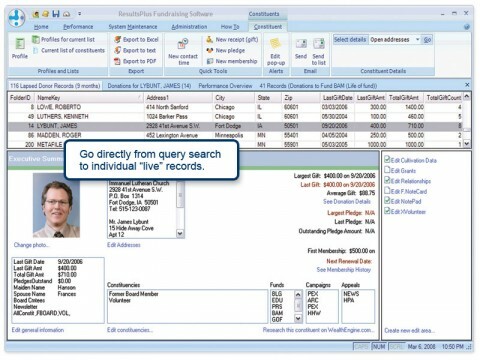 While some companies charge per record, ResultsPlus gives you all the functionality you need no matter how many records you have. As your organization grows and you organize more fundraisers, events or campaigns, you can easily add to your system. Establish and build relationships: How much information can a spreadsheet really hold? Are you able to record important details about donors like their birthdays, anniversaries, seasonal address changes or other personal information? Do you make detailed accounts of your correspondence so that you can carry on a meaningful conversation the next time you talk with them. The most important part of fundraising is establishing relationships with your donors and building on those relationships. A donor management system lets you record all the information that’s important to you AND your donors so that you can focus on managing those all-important relationships, not managing a spreadsheet. So, what do you think? Is it time to shred the spreadsheets and move your donor data into a nonprofit CRM? If so, feel free to contact us with any questions that you have about ResultsPlus Nonprofit CRM at success@resultsplussoftware.com.